Incredible 15x Optical Wide-Angle (28-420mm) Zoom-NIKKOR Glass Lens - quality optics provide exceptional images throughout the zoom range. The lens is built on a proud heritage of producing precision camera optics that delivers superb colour and razor-sharp results. This incredible lens offers versatile compositional freedom with its wide-angle (28mm) to super telephoto coverage (420mm). Sweeping landscapes can be captured as well as those zoomed-in close-ups of the action on the baseball or soccer field! Big, Bright 3.0-inch High Resolution HVGA (460,000-dot) Clear Colour Display makes it easy to compose and share your pictures with a wide-viewing angle and Clear Colour Display anti-glare coating. VR Image Stabilization by sensor shift minimizes the effect of camera shake. New Hybrid VR Image Stabilization by combining sensor shift and electronic stabilization minimizes the effect of camera shake. High ISO up to 6400 capability helps when shooting in low light or capturing fast-moving subjects. 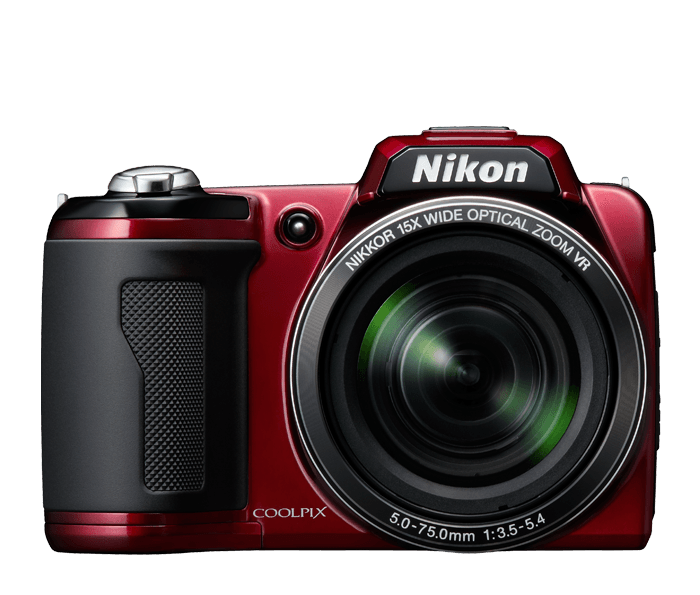 Sports Continuous shooting enables high-speed shooting at approximately 11.1* (at 3MP) fps for up to 20 images. Smart Portrait Mode the camera detects and focuses on the subject and automatically fires the shutter when the subject smiles, making sure you’ll always catch the decisive moment. Blink Warning, when activated, alerts you that the subject may have blinked and allows you to retake the photo. Get 840 still images or up to 7 hours of HD movie with the included Energizer® Ultimate Lithium AA batteries for ease of mind with long battery life plus easy, anywhere replacement of AA-size batteries. Nikon EN-MH2-B4 NiMH rechargeable batteries are available as an option. 15 Scene Modes for optimized shooting in various settings.